Aside from the stuff on the company's own website, it's hard to find information on the Van Dessel brand or their Country Road Bob singlespeed/fixed gear 'cross bike. That's a shame. Despite its obscurity, this bike has a lot to offer the budget-minded rider. Since late 2002 I had been battling a bad case of single-speed fever. I was hoping to build or buy a cheap, durable 'do-it-all' rig for all-weather riding on or off the pavement. Having obtained the wife's permission to add a fourth bike to the fleet, I started trawling eBay, and turned up a Country Road Bob frame, fork and headset for $220. 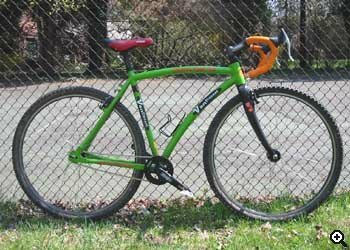 (The same 2002 frameset, including a pair of house-brand hubs, presently retails for $299 on the Van Dessel website.) I had been secretly lusting after a Surly Cross Check, but the deal on the aluminum Bob was too good to pass up. When I got the frame home I was pleasantly surprised by the quality of the finish. The paint and decals looked good, and there were rack and fender braze-ons, plus a mount for a water bottle. It was on the heavy side with unsightly toothpaste-like welds, but it gave a great impression of sturdiness. And my wife liked the bright--and I mean BRIGHT--green color. Now that the frame was safely under my roof, it was time to add components. I already had a suitable stem, drop bars, brake levers, seatpost and saddle in the parts bin, and the cast and crew of the Tenafly Bicycle Workshop in Tenafly, NJ, helped out with cranks, bottom bracket, hubset, rims, freewheel, chain, tires and a pair of canti brakes--some of them, in my opinion, a distinct improvement over the stock Van Dessel kit. (A complete list appears at the end of this review.) The total cost of bike and components was around $675. The build took place over a couple of weekends. Since the frame offers plenty of clearance, I went for 29" WTB mountain bike tires. I also opted for a cyclocross setup with drop bars and cantis, tho' the bosses would have taken linear pulls if I'd gone for flats. Everything came together neatly apart from a minor chainline problem which required the use of a bottom bracket spacer. All-up weight was 22.5 pounds, but lighter parts would have knocked a few pounds off the total. With its curved top tube, S-bend stays, drop bars and fat tires the Bob is certainly an odd-looking rig, and it draws a lot of stares. (The electric green paint and orange bar tape don't help.) On one of my first rides around the neighborhood, the newly-minted Bob got the 'Yo, that bike is sick, yo!' stamp of approval from a local highschool kid. Dont buy this bike unless you're prepared to answer questions. The Bob finds itself at home on just about any surface. The longish stays and wheelbase contribute to predictable handling but there's no obvious penalty for the extended rear triangle. This frame is robust enough to absorb punishment and nimble enough to be entertaining. On pavement, the Bob's aluminum frame and carbon fork provide decent feel. It may not be jackrabbit-fast, but it accelerates fairly quickly and will dig into turns. Despite my fat tires and 32x16 gear, I've taken it on a few slower club rides, where I've found the bike's strength a bonus. It practically invites you to flick it off curbs and over potholes. The same handling qualities that make the Bob a fun street bike also make it a good choice for fire roads, carriageways and light off-roading. Since the frame and fork do a fine job of soaking up bumps, it feels at home on dirt. My own experience has been that the Bob prefers climbs over descents, but that may be because my stem is on the short side. However, despite being a fine street and fire-road bike, the Bob is not a good performer in tight singletrack. The 700c wheels which roll so smoothly on fire roads get hung up in rocky sections, and a serious problem with wheel-toe overlap makes guiding the bike through typical East coast rocks and roots into an exercise in frustration. Momentum is quickly lost when tire meets toe and the limited steering makes low-speed course corrections a drag. You might avoid the problem by using a smaller tire and/or shorter cranks. A bit more fork rake might help, too. 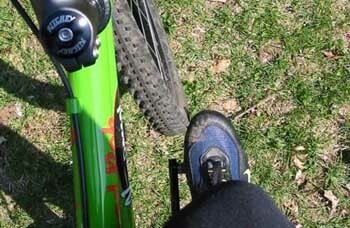 Presently, riding the Bob on singletrack is like taking a five year-old kid shopping for shoes. The Van Dessel Country Road Bob is a versatile all-around single-speed/fixed gear bike that can be used on most surfaces. The bike does not stand out in any particular area, but neither is it deficient. The Bob is always ready to go. If purchased as a frame/fork, it will accept a wide range of components and can be built to suit the rider. My only complaint is that, for a longish bike, the Bob's cockpit feels cramped. However, since my setup differs from the stock model, this may not be Van Dessel's problem. Chris Accetta is an avid cyclist from New Jersey. He finds peace and harmony in a single gear. Read other opinions on RBR, and check out Ron Moffit's BuzzBomb review.